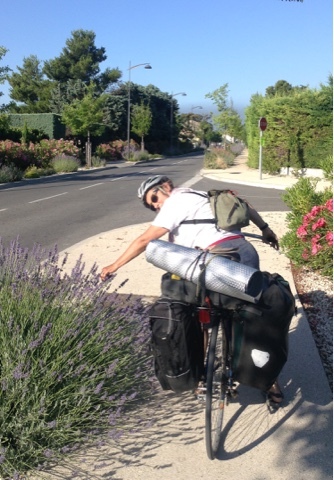 Janina was happy to learn that it is fully acceptable to help oneself to a sprig of lavender from the plants that decorate many towns in Provence, another of the great amenities of bicycling through France. It doesn't take more than a sprig to perfume our tent. The aroma is said to facilitate sleep, though we hardly need assistance after a day of biking, especially in the present heat wave. Two of the past three days we took a five-hour afternoon break from the ovenish heat. One break we spent as squatters on a farm that we thought had a room for rent. We were misdirected to the farm by a cyclist who is a fellow member of Warmshowers. We met him and his wife in a bakery that we had fled to when the noon-day sun became too much for us. He could see we were done in and knew no one in their right mind would want to continue cycling in such heat. He was from out of town but was visiting a friend who lived on a farm two miles out of town and had a spare room she rented out for thirty euros a night. They were headed there for lunch. That sounded like just what we needed. They called her to verify the room was available and then pinpointed its location on my GPS device. Unfortunately he didn't get the right location, nor did he give us her name or phone number in case there was any snafu. We did know though that he lived in Draguignan. I found him on the Warmshowers website. His phone number was listed. We called but he didn't get back to us until later in the evening when we were already settled in at a campsite. The farm had a table with chairs under a tree where we sat, at first hoping the Warmshowers guy might show up, until it was clear we were at the wrong place. There was a water spigot, so we kept well hydrated. We felt as if Providence was once again looking after us for us to end up at this unlikely, but perfect, refuge. While we read and wrote we were entertained by the ducks and chickens languishing in the shade straddling a fence beside us. It was so hot a dog beside the barn barely gave a yelp, nor arose from his shady patch. A Siamese cat peeked out of the barn, but didn't venture out of its shade. When the owners showed up we hoped they'd let us pitch our tent behind their barn. But in the meantime I did a search and discovered a campgrounds just two miles away. By five when the heat began to abate we cycled on over. The next day we reached the sizeable city of Apt by eleven, just as we were beginning to melt. We sought refuge from the heat in its rather mundane public park. We nabbed the last bench in the shade, all the others occupied by teenaged boys and a couple of stray older men. Behind us under a tree a young couple was smooching and smoking pot. We ate and read until two, when the library reopened after its lunch break. It had no air conditioning and was just slightly cooler than being outside. But we needed to recharge our devices. We sat in a corner where there was French poetry and a lone shelf of American literature translated into French. Janina read some of Cendras, who she had done a dissertation on, and some of her other favorite French poets, and perused the French translations of Steinbeck and Faulkner and London, all regional novelists she noted, who would appeal to the French. We bravely resumed cycling at four, headed to a municipal campground fifteen miles away in the village of Maubec, cosily nestled up against a high ridge. It took us over two hours to reach it as a fierce wind had blown in. At least we were on a bike path for most of the ride, the same path that we followed for six miles into Apt. It was on an old rail bed, so was flat and even shaded at times by trees. When we picked up the path on the way into Apt, Janina exalted, "That removes one layer of anxiety," not having to be concerned about traffic. She also didn't have to be concerned about being caught out in the beating sun as happened the day before until we staggered into the bakery. But she was still nagged by a pain in her shoulder and side that she hoped was due to the strain she was suffering from pushing down the gear lever for her rear derailleur. She feared though it might be the symptom of a heart attack. Earlier she thought she might be suffering appendicitis. That was a false alarm as was this. She was having so much difficulty shifting that when we came to a hill she'd get off her bike and turn it over to me. I'd ride it a few feet and make the shift for her. None of this though had her regretting her choice to continue cycling rather than taking the train. She was pedaling through the fabulous French countryside and seeing sites and having encounters that gratified her soul. 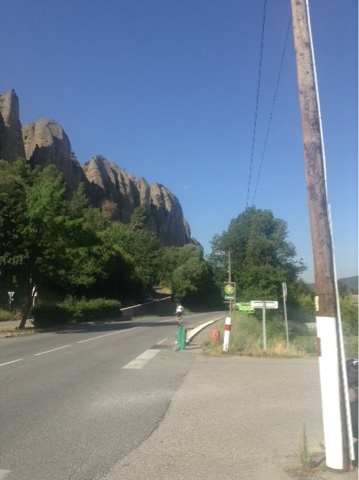 The climbing was minimal as we were mostly descending on a highway known as The Road to the Alps. 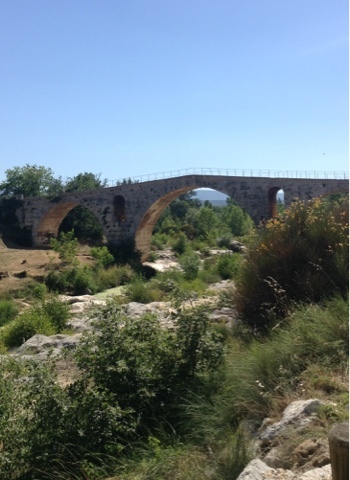 The bike path took us across an old Roman bridge. The day before we cycled past a spectacular upthrust of rocks known as "The Peninents," that might have been transplanted from Canyonlands. The rocks were said to have been robed monks petrified back in 800 for leering and lusting over seven beautiful women when they left the harem of a warlord who had been holding them hostage. 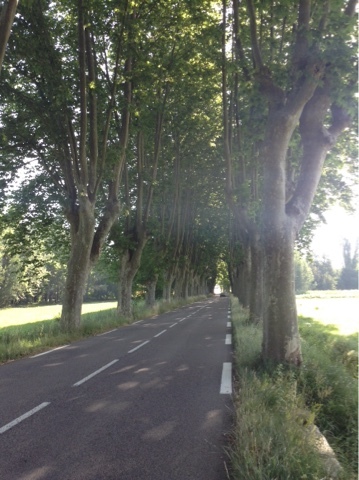 After two days of extreme heat we were saved by long stretches of cycling in the shade of towering plane trees. We weren't the only ones pausing to take photos of them. 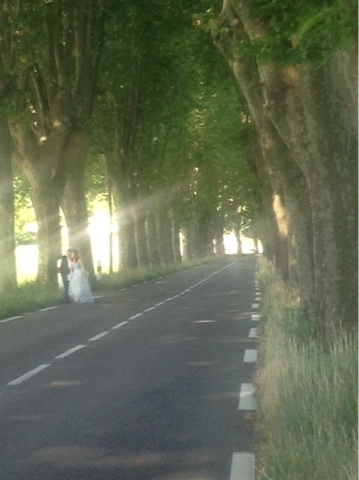 We saw motorists doing the same and also a wedding photographer shooting a bride and groom who happened to be Chinese. 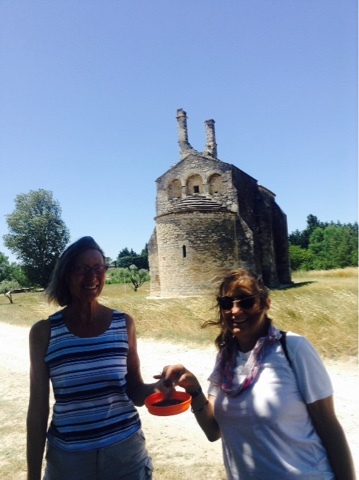 When we pulled off the road to have a closer look at a small chapel, a woman sitting in her van having some lunch in the shade of the lone nearby tree stepped out and asked if we needed water. We didn't but it was another opportunity for Janina to have a friendly conversation with someone interested in our undertaking. She was driving to Antibes to visit her husband's grave. They had traveled extensively, including a drive from Denver, where her husband had some work, to Los Angeles, where their son was going to college. She ducked into her van and offered us a bowl of cherries. She and Janina chattered away as if they were old college chums who hadn't seen each other in decades. Once again we felt as if she was another who could have been a best friend if we lived nearby. As we continued on our way we could only say Vive La France. What a sport you are, Janina. Hang in there. You are fortunate to have a patient coach.